Technology companies designing solution-based products for women are few and far between. In fact, I had a tough time finding them. But a few entrepreneurs are filling the void left by major technology companies by actually designing products to fit women's lifestyles instead of just "pinkifying" them. Look no further than Kansas City-based Trellie. Trellie is the answer to the missed call. If you are like me and have a handbag filled to the brim with coupons, snacks, wipes, keys, a wallet and smartphone, then you know that finding your phone before the call goes to voicemail is next to impossible. Ok, ok, maybe I should clean out my handbag more often -- but if your life consists of eating a half eaten PB&J over the sink while balancing a kid on one hip, then you know that an empty, organized purse is a pipedream. Enter the Trellie by Trellie. The Trellie is a cute, shiny bluetooth enabled device that clips on the outside of a handbag and lights up for an incoming call and blinks for a missed call. No digging through your purse; no maxed out voicemail. Ingenious right? The Trellie was the brainchild of Claude Aldridge and Jason Reid, who were sick of trying to reach their wives (sometimes in urgent situations) and getting voicemail. The problem, they realized, was that their wives phones were buried in a "sound-insulated black hole" at the bottom of their purse. "Trellie was based on one of the most basic problems women face, 80 percent of women carry their phones in their purse and miss over 50 percent of incoming calls on a daily basis because they can't hear it ring or feel it vibrate," said Anita Newton, SVP of Marketing for Trellie. The guys quit their jobs, secured a manufacturing partner, and four months later were testing prototypes. A few weeks later, they hired Anita Newton to handle business development, strategy and marketing. Trellie has raised over $18,000 so far on funding platform Kickstarter, and if it reaches its goal of $30,000, you could see Trellie in the spring for $49.99. Next up: The Everpurse. 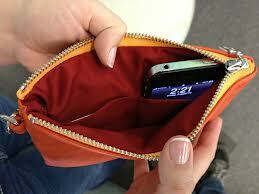 It's a purse that charges your cellphone. It not only looks adorable, but it's intensely practical. For women who are constantly on the go and don't have time to charge their cellphones, the Everpurse is a game changer. The concept was developed by Liz Ormesher Salcedo, who spent countless hours driving around the city of Chicago for her job as a social worker. Her phone frequently died so keeping her phone charged without strapping on a giant battery became a big issue. Unable to find a solution to her smartphone-charging woes, she developed one herself. "It came out of my own need for battery life," Salcedo said. "I always lose my chargers and the batteries are ugly. A big battery on a phone? I really was looking for a better solution for myself. My husband likes to tinker with electronics, so we bought off-the-shelf parts and found a way to put it all together. Once we had a working system, I figured out how to integrate it in a purse." The Everpurse contains hidden technology in the lining of a fashionable clutch, making it possible to simply drop your phone in a pocket and let it power up. 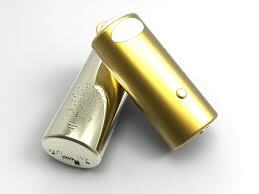 It's capable of charging your iPhone twice each day. The Everpurse was launched on Kickstarter in early September and has raised over $238,000, surpassing its initial goal of $100,000. It's available to pre-order for Spring 2013 delivery and comes in several different fabrics and colors. Croc-pattern leather or aquamarine? Everpurse has you covered. Now, if you are a woman with long nails, then you know navigating a touchscreen can be a difficult feat. Enter Nano Nails; the fingernail that also works as a stylus. The concept came from Cleveland Clinic-trained dermatologist Sri Vellanki, who was frustrated that she couldn't accurately text on her iPhone because of her nails. "I decided that I could make a mass produced, economical, safe, artificial conductive nail that would work on the most commonly used smartphones," Vellanki said. "I wanted the Nano Nails brand to be a solution for the female consumer without significantly changing her usual nail care routine." Vellanki already created an over-the-fingertip stylus called Tech Tips, but Nano Nails is directly designed for women. They take the technology of a stylus, which produces an electrical conductor that touch screens detect, and merge them with fake fingernails. Nano Nails are placed under the index fingernail, either as a full press-on nail or nail tip. Vellanki, who so far has funded Nano Nails on her own, plans to take it to Kickstarter to fund additional production capacity. Expect to see Nano Nails this May in packages of four for about $10.00. They can be applied at a salon or by the consumer. What sets these entrepreneurs apart from the big guys? They are actually listening to women's needs and creating products to fit their lifestyles, instead of just selling current technology and painting it pink. "So many companies think tech for women is a pink-bedazzled iPhone case," Trellie's Anita Newton said. "More companies should be designing solutions for women, but few do," said Newton. What it so striking is that women account for nearly three-quarters of all household spending, according to the Boston Consulting Group, and most are actually in charge of household finances. Moms, in particular, have even more say when it comes to technology. "Moms are leading technology adoption in virtually every digital category, from internet usage to mobile phones and even social networking," Newton said. Part of the problem is that women are underrepresented in key job roles within the technology and media sectors, so the result is pink tech products instead of solution-based products geared specifically to women's needs. This was rather obvious at The Consumer Electronics Show (CES) in Las Vegas, where there was no shortage of pink products. "At CES, I had women that thanked and hugged me for addressing their issues," Nano Nails' Vellanki said.